Though Fidel Castro Has Stepped Aside, Cuba's Old Guard Remains In Charge : The Two-Way Raul Castro's longtime confidante Jose Ramon Machado Ventura will be No. 2 in the leadership, and Vice President Ramiro Valdes is No. 3. "Raul Castro has been named first secretary of Cuba's Communist Party, with his aging brother Fidel not included in the party's leadership for the first time since its creation more than four decades ago," The Associated Press writes from Havana. 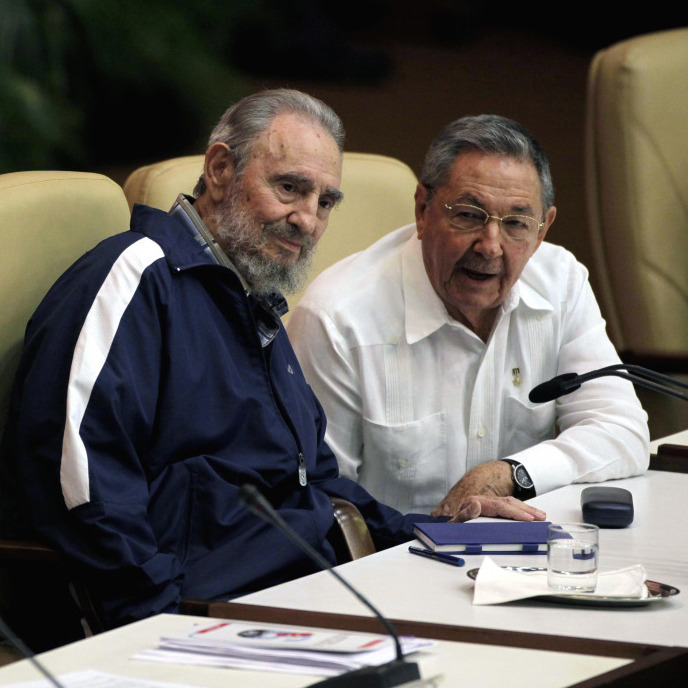 Fidel Castro, left, and his brother Raul at today's Communist Party Congress in Havana. And, "despite raising hopes during the gathering that a new generation of leaders was poised to take up important positions, Raul announced Tuesday that 80-year-old longtime confidante Jose Ramon Machado Ventura would be his No. 2. The 78-year-old vice president Ramiro Valdes was named to the No. 3 spot." According to the Miami Herald, Fidel Castro "was in attendance at the Communist Party's Central Committee Tuesday morning." And, "there were tears in the eyes of most of the delegates who were expecting an emotional speech" from him — which as of 11 a.m. ET had not happened. As Eyder previously reported, Fidel Castro quietly announced last month that he was no longer leading Cuba's Communist Party. He had given up his government posts in 2006 because of ill health. Fidel Castro is 84. Raul Castro is 79. Update at 1:15 p.m. ET: The Associated Press has posted video of Fidel Castro's arrival at the party congress.